Red Envelope featured in Town & Country! 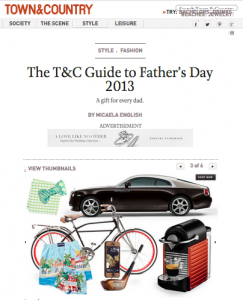 Congratulations to our Client,Â RedEnvelope,Â for their recent feature in Town & Country! Traditionally “woods” were actually made of wood and designed to drive a ball long down the fairway. This iPhone 5 dock packs just as powerful a punch by stepping up their game when it comes to docking their phone. 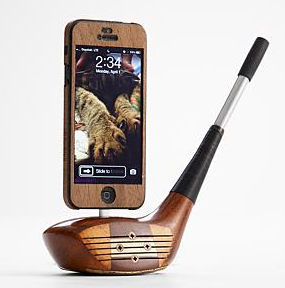 Made out of an authentic vintage golf club that pre-dates 1980â€™s metal clubs, it docks a phone or iPod that any golf aficionado will love. Launched in 1999,Â RedEnvelopeâ€˜s mission remains to make gift giving for every occasion easy and fun.Â From tokens of gratitude to expressions of love, as your partner in giving,Â RedEnvelopeÂ offers a unique and wide-ranging collection of thoughtful gifts for every occasion and everyone on your list â€” around the clock, all year round. Check them out atÂ www.redenvelope.com!